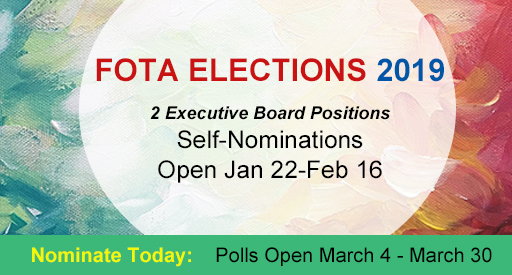 The Nominating Committee is pleased to call for nominations from FOTA membership to fill the FOTA Board positions of Vice President & Treasurer. Nominations should be submitted as early as possible so that the Nominating and Leadership Development Committee can fully consider proposed candidates. The election will take place March 4 - March 30 NOTE: The elected officers of Treasurer and VP begin their terms on July 1st, 2019 - orientation and training of new officers occurs March 31st through June 30th. Positions Up for Election: Click links to view the job descriptions. The officers of this Association shall be the President, Vice President, Secretary and Treasurer. The President, Secretary and Treasurer shall be chosen from the roster of occupational therapists, who have been in good standing with the AOTA and FOTA for a year prior to nomination. The Secretary and Treasurer shall be either OTs or OTAs in good standing with AOTA and FOTA for a year prior to nomination. Nominees shall be voted into office by electronic or non-electronic ballots of voting members and seated on July 1. The President, Vice President and Secretary shall serve for terms of two years and shall not hold the office for more than two consecutive terms. The Treasurer shall serve for a term of three years and shall not hold the office for more than two consecutive terms. Prepare for their elected duties. Assume office in the absence of the officer. Discharge the duties of the President in case of absence or during a vacancy in the office of President. Provide oversight for the work of the Conference Convener. Self-Nomination Form: Click on this link to nominate yourself for the open positions.